In Starfinder, you can shoot for the stars, and if you miss, SHOOT HARDER. Munchkin Starfinder takes the hit Paizo RPG and amps up the ridiculousness with our iconic humor and the awesome art of Howard Tayler. The wait is almost over! 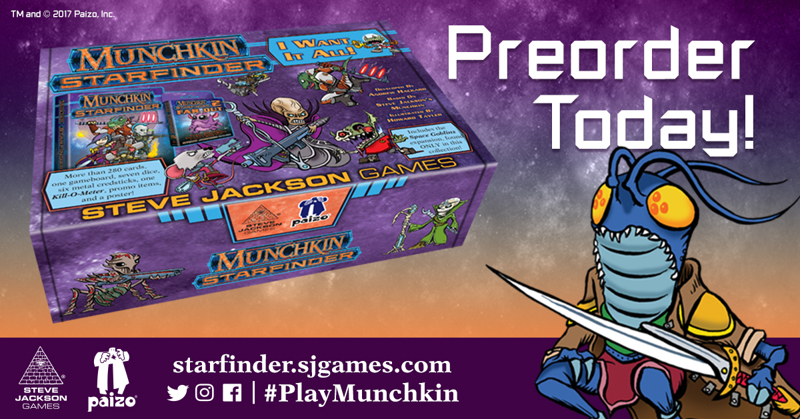 Preorders are open now for Munchkin Starfinder, including the game and the I Want It All Box! This box contains all the stellar extras unlocked by the Kickstarter campaign earlier this year, including Munchkin Starfinder 2, Space Goblins, a Kill-O-Meter, board with tokens, sturdy metal Credsticks, and much more. It takes the base game into the next dimension! Preorder this bundle of Munchkin Starfinder joy at your local game store, or on Warehouse 23! Look for this to hit your doorstep this September.